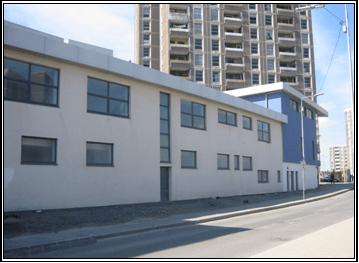 Ballymun Arts & Community Resource Centre – Duggan Brothers Ltd. 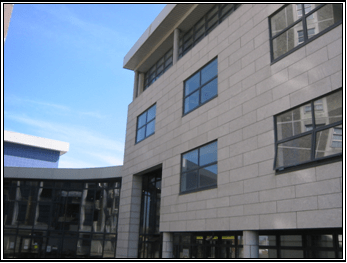 This project, the first in the Ballymun Regeneration Scheme, comprised the construction of new commercial, cultural, social, educational and recreational facilities. It houses, amongst other facilities, theatres, recording studios, rehearsal rooms, conference rooms, a crèche, offices, training rooms, restaurant, bar etc and as a result of this diversity of uses it involved a wide range of specialists finishes and sub-contractors. The basements were constructed with the aid of sheet piling, and consist of “Caltite” waterproof concrete. The superstructure consists of in-situ reinforced concrete, with load bearing blockwork, structural steel and pre-cast concrete. The walls are finished externally in stone cladding, ceramic wall tiling and plasterwork. Being the first project in the regeneration scheme, this project attracted the attention of the entire community. The restricted nature of the site, dictated that the building occupies almost 100% of the footprint of the site, which wrapped around two sides of McDonagh tower, leaving nothing but a pedestrian walkway between the two and busy streets on each of the other sides. We were mindful of the impact of noise, dust, etc., on local residents and quickly forged a strong and positive relationship with the residents. We made a point of holding frequent community liaison meetings, where we shared our work plan and encouraged comment. Through this forum and the communication / liaison process, we found that no work activity was insurmountable and that a busy / complex construction site could co-exist with a high rise residential building. Through sports sponsorship programmes, we forged strong links with the management of the local schools. Through this link we conducted regular talks with all school children, where we raised awareness about the dangers associated with construction works. We drew upon the services of the Garda Community Liaison Officers, who were helpful in introducing us to many community representatives. This liaison process formed a key role in gaining the support of the local community, which made the execution of this project possible, on a very restricted site.